Lately some users are complaining that the logon times are increasing. After some investigation we came to the conclusion that the users are saving a lot of files to their Citrix/Terminal server desktop. The flex file would be around the 8 GB. My manager asked me to come up with a solution so that the users aren’t able to save files to their desktop but allow them to save shortcuts. 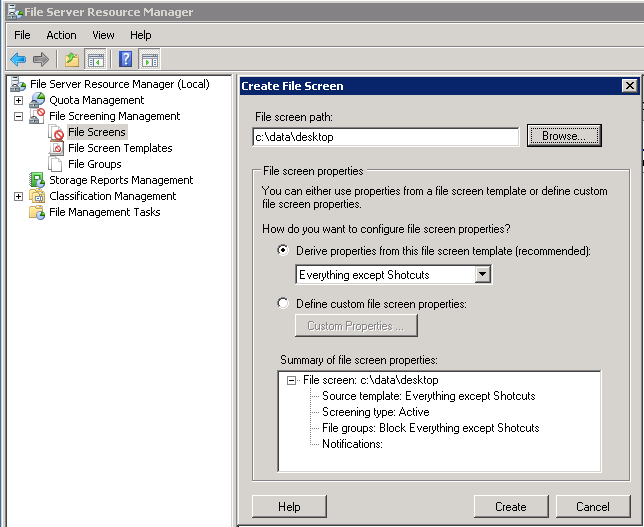 File Screening is available on windows 2003R2 and higher and is part of the File Server Resource Manager. 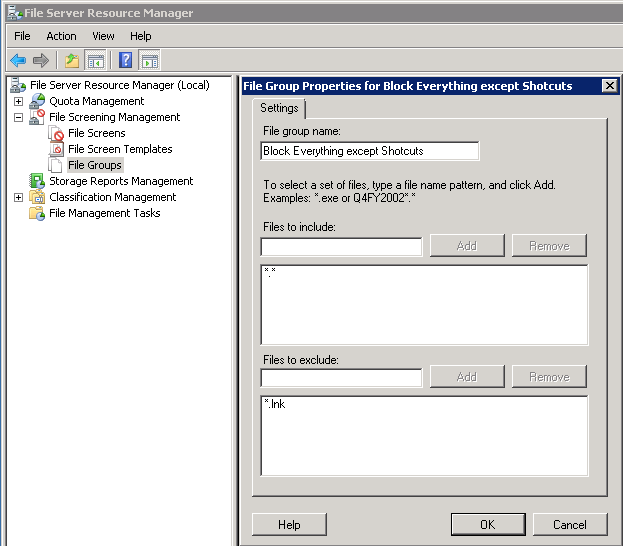 A File Screen can block file that belong to a particular file group from being saved on a volume or folder tree. It also affects all the folders in the designated path. 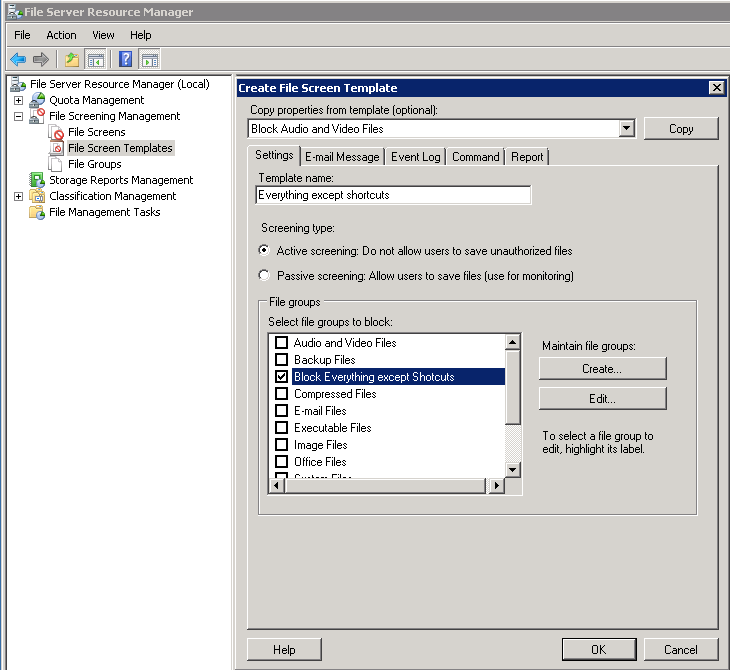 You can configure File Server Resource Manager to generate e-mail or other notifications when a file screening event occurs. Active screening prevents users from saving unauthorized file types on the server. Passive screening monitors users saving specific file types and generates any configured notifications, but does not prevent users from saving files. We choose the active screening. File Server Resource Manager is a role service of the File Services role in Windows Server 2008. It can be installed as part of the File Services role, using Server Manager. After you install the role service, you can use the File Server Resource Manager Microsoft Management Console (MMC) snap-in. Start File Server Resource Manager. Expand File Screening Management. 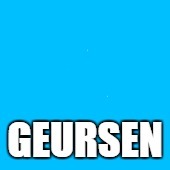 Select File Group. Right mouse click and select “Create File Group…” To block all files except shortcuts use the following settings. Create a new File Screen Template with the following settings. Create a new File Screen with the following settings. • Redirect the Citrix Desktop to a local disk or a shared folder on a File Server. The last is not preferred because of open file on the file servers. • Install and configure File Screen. • Possibly apply a folder quota on the desktop. This is not mandatory. When everything is in place the users will receive the following message when they try to save an item on the desktop that isn’t a shortcut. For the scripting guys among us. It is also possible to install and configure File Screening through the command line with the following commands. FileScrn filegroup add /filegroup:Allow_lnk /Members:"*. *" /Nonmembers:"*.lnk"
When using filescreening in combination with Immidio Flex you need to add the extension *.tmp to the file to exclude. When flex is restoring the desktop.zip it will write a *.tmp file to the desktop. When this isn’t possible Flex will stop restoring the desktop.zip. The Ukash payment approach could possibly be utilized in all those websites which contain an Ukash logo.